The Rest of the Story. The race for the lightest camping hammock is still being run, but there are a few front runners who have set the pace. 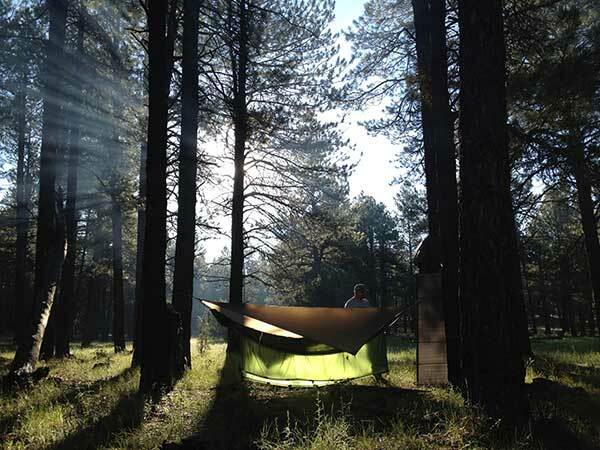 When BIAS came out with their Weight Weenie Micro Hammock, it was unusual because it was slightly narrower but also longer than typical hammocks on the market. Most hammocks hover around 10 × 5 ft (305 × 132 cm), but the Weight Weenie Micro changed their dimensions to 11 x 4 ft (335 x 132 cm), yet dropping to an amazing 7 oz (198 g). I have found that my “sweet spot” in most hammocks puts my upper torso roughly in the middle of the hammock and laying diagonally with my feet off to one side. This often leaves a lot of extra unused fabric flopping on the sides. Narrowing a hammock eliminates that extra fabric, but maintaining the same length artificially tightens the edges (gunwales) of the hammock contributing to shoulder squeeze. By lengthening the hammock, BIAS eliminates this issue, along with softening the calf ridge that is also common on gathered end hammocks. For areas or seasons when bugs aren’t a problem, a simple, gathered-end hammock is about all you need. If there is one thing I would do with this hammock is add a zippered bug net, tailored and cut with a trapezoidal shape, and use a structural ridge line. New to the hammock life. I have always used a tarp and bug bivy setup so I am use to the light weight and would want to match or come close to that weight in a hammock setup. I have been thinking a going with Hennessy’s Ultralite setup because of the all in one ease. But at 1lb 15oz I feel like I can go lighter for the price they are selling at. So I was looking at this hammock in combination with their buginator nest and possibly a cuben fiber tarp. My question, is there enough room for a person who is 5’10” to sleep on a diagonal without having my feet extend past the hammock? I do not really want my legs, pad, and quilt hanging off the hammock. You sound a lot like me 🙂 I’m the same height and this hammock would fit you very well. In fact, you are the perfect height for most hammocks. The Hennessy Hyperlight (I’m laying in it as I type) is a great set up for all-in-one convenience, and it can go lighter by switching out the rope suspension and tarp, but if your goal is to be SUL, mixing and matching is the way to go. When I go SUL I use a simple hammock and use my HUG bug net. Cuben tarps can cut additional weight. Mountain Laurel Designs sells a great diamond Cuben fly. You might even ask Adam over at HammockGear.com to make a custom asym Cuben fly for even more weight loss. Feel free to email me if you want more lightweight hammock ideas. What do manufacturers usually mean by width and length of a hammock? Are these the dimensions of the fabric they’d used or the actual dimensions? Speaking of length of a gathered end hammock, is it measured from where the channel is sewn of from the outer edge of the channel? It is usually the finished, flat dimension. The fabric may start off a little wider and longer before it is hemmed and gathered. I do my own measurements in my reviews and I usually take apart the hammock, if possible, and measure the flat dimensions of width and length from edge to edge. Derek, I’m looking to get my husband a long lasting, quality, comfortable hammock for week long trips on the rivers etc and have no idea what to consider. Lightweight and compact are a must but would like a bug net also as we live in the south! Any recommendations? Hi, Derek! I’m looking for ultralight hammock options for an upcoming thru hike and am having some issues with fit and comfort. I’m 5’8″ and have been using the Dutchware Chameleon which I feel is too big for me and not as light as I want, but I can’t get comfortable in my Grand Trunk Ultralight hammock (9’6″ x 4’6″) to save my life, even with adjusting the ridgeline length multiple times. However, I’m very comfortable in my ENO Double Nest which is 2″ shorter than the GT Ultralight. Should I/can I stick to the 9’6″ length hammock with wider width or would you recommend just going with a longer length? What ultralight option(s) do you recommend to really pursue (FWIW – BIAS’ website is down so not sure if they’re still in business)? Thank you! Interesting. I’m sorry to hear you’ve had bad experiences with the ultralight. To make it work for me I pitch it much more shallow. For your height I would have suspected the ultralight would be a food fit. But for a thru hike, are you concerned about bugs? Which trail are you hiking? Personally, I think a hammock with integrated bug netting as worth the few ounces of weight but the trick is getting a simple drain with less zippers and additions. 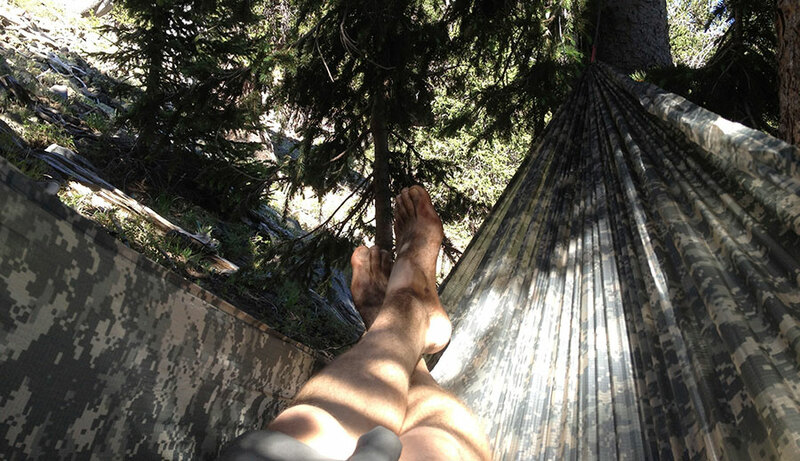 For this reason I recommend looking at the Darien hammock from DreamHammock. Thanks for the quick reply! I’m thru hiking the Mid State Trail in Pennsylvania in April so bugs probably won’t be a problem, but I am going to use a Dutchware Summer Sock if they are any and to add wind protection for me and my underquilt when it’s colder. I’ll try pitching it at a shallower angle first. If not, would going with a longer/narrower hammock like the BIAS Weight Weenie or a similar length/wider hammock like the Hummingbird Single+ be a better option? Let me know how the shallow angle works. That method would be the same for a longer but narrower hammock as well. You simply can’t hang those with a deep angle (30°+) because you wouldn’t be able to lay diagonally.